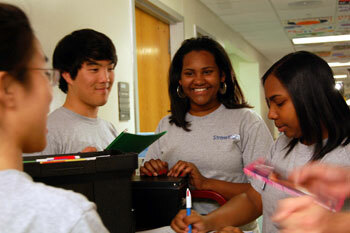 This is the core of the program – companioning with teens in the hospital. A visitation team goes into the teen rooms every afternoon, with an offer to provide movies, play a game of cards, talk, make a ShandsSpace, give Mom & Dad a coffee/food break, hear their story and build a relationship with a teenage patient. This shift happens every Monday, Tuesday, Wednesday and Thursday night (5:30 – 8:45 PM). There is no structured “one-thing” happening. Video gaming is pretty popular as are beading and crafts, board games, and UNO. Our teens also just like to use the Internet. There is a Wii and a pool table. Yes, relationships are formed, but diversion is the key element. The therapy here is about forgetting the hospital for an hour or so. It is also about getting them to meet other teens who also are struggling with different and similar things. Focused interest just seems to happen as you are working with Streetlight. You start to have a soft heart for one area or another, or you see a need and have an idea. And we welcome ideas!!! But focus groups do not work as well if you do not have that weekly relationship with your teens through shift work. To learn more about our four project teams, click on the image below. Volunteers also have the opportunity to be further involved by becoming a Streetlight Gaming League moderator. These volunteers are further trained in how to introduce someone to the Streetlight Gaming League, how to connect with patients through the Gaming League Discord and online gaming communities, and how to promote and organize cool events that engage our patient community whether they are at Shands or at home. To find out more, check out https://streetlight.ufhealth.org/disease-specific-support/streetlight-gaming-league/ .